Payroll is probably the most complex element of small business accounting. Not only are you directly responsible to your employees, but you also need to make sure you are handling everything related to benefits and payroll taxes correctly. 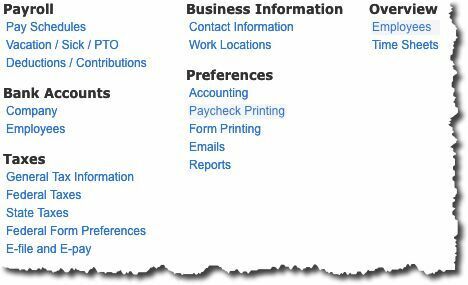 You would have entered information about your Contact Information and Work Locations(under the Business Information heading) when you first signed on to QuickBooks Online. At the same time, you would have been exposed to the Chart of Accounts, which already has accounts designated for payroll. You can see them by clicking Preferences | Accounting, but please do not customize these. If modifications are needed, we will do them for you.